SQUAMISH, BC – Howe Sound Brewing has announced the release of a new seasonal sampler pack focused on dark and strong beers that are well suited to the winter months. 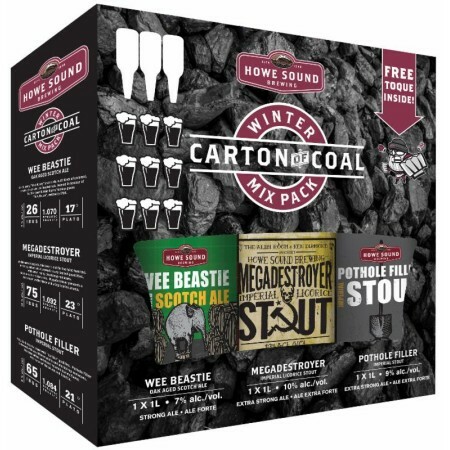 The Carton of Coal Winter Mix Pack features 1 litre swing-top bottles of Wee Beastie Oak-Aged Scotch Ale (7% abv, 26 IBU), Megadestroyer Imperial Licorice Stout (10% abv, 75 IBU), and Pothole Filler Imperial Stout (9% abv, 65 IBU), along with a free Howe Sound branded toque. Carton of Coal is available now until Christmas at select private and government liquor stores throughout British Columbia.